My client is GM Asia Pacific for a European company who manufacture specialized bolt securing systems. Apart from the “usual” business development that comes with expanding into a new country and finding new production locations within Asia, the GM was also charged with setting up a new office in Singapore for approximately 12 permanent staff. Feng Shui Focus was involved from the beginning of the setup and started by giving advice on the selection of the Company’s office. It was important to determine which of the prospective offices would be more beneficial for the GM, because only a leader with good Feng Shui will attract good success luck to a company! advising on best possible location for the GM’s individual office within the premises. Once the decision was made and the lease signed, the office was completely renovated so that work could begin on the interior design. 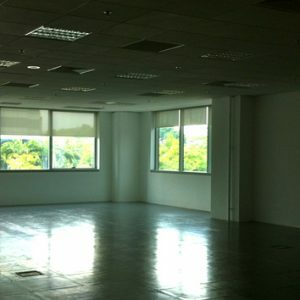 Before the renovation, the office premises were just a huge, open space. The second layout took account of my suggestions and looked very different! The individual managers’ offices were now located along the side of the premises and at the back by the window front was an open-plan work area instead. A few tweaks here and there were still necessary and the layout was finalised. Please note that the designer has rotated the floor plan by 180° and the entrance is now at the bottom of the plan. The main door is the key to success! The first important step is to make sure the main entrance of the building is compatible with the head of the company. This brings the right kind of Sheng Chi (Success) luck to the GM on a daily basis and the business will thrive under his/her authority and leadership. If the GM has good Feng Shui he will be able to bring success to the company too. Every building has a wealth spot and of course the location of this is important! You do not want it to be in a lift, toilet, or store room. The wealth spot can be located using the Flying Star formula of Feng Shui and – provided it is in a good location – needs to be activated with a water feature to invite the best possible wealth luck for the business. 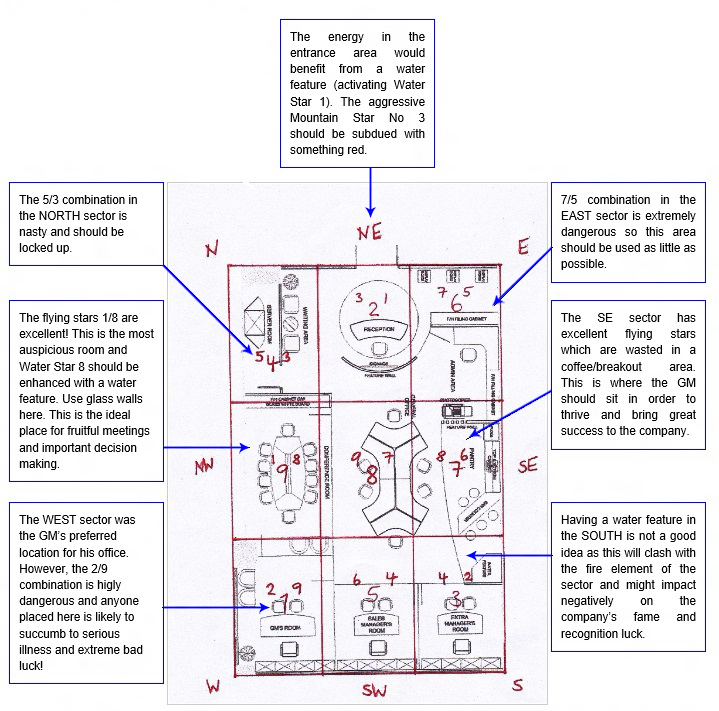 In this case, the wealth spot is in the conference room, where the Water Star 8 is located – the perfect place! Enhance Fame and Recognition luck: This is why I was so delighted to see the two horses placed between the plants in the South sector: Not only do I find them absolutely adorable, but the horse is also a very popular symbol of success. 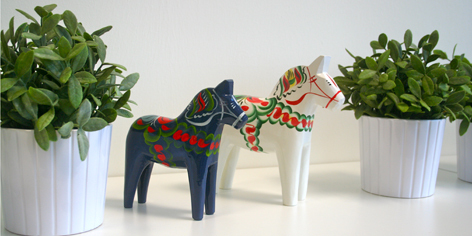 The GM explained that they were traditional Swedish wooden horses (“… in Sweden you see them everywhere!”) and they were a gift of the Global Sales Director from Sweden for the inauguration of the office. How appropriate! 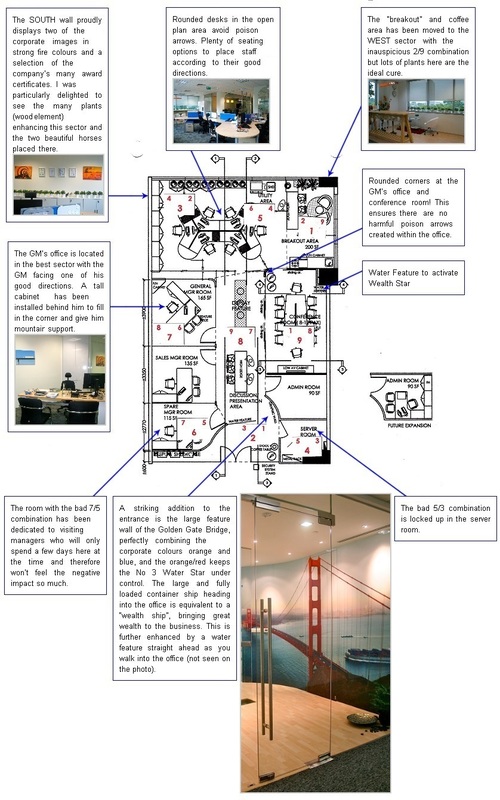 The office design and layout has received much praise from visitors. The Global Sales Director of the European HQ was very impressed and as a result I have been asked to help make adjustments to the company’s Asian HQ office in Shanghai. I am confident that this business will be very successful in Singapore and recruitment of staff is already in full swing.